Sodom is a video game villain. 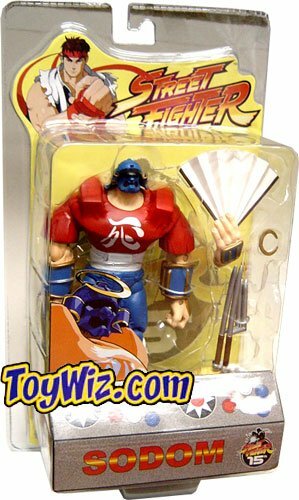 He’s originally from the Final Fight brawling games series, but later returned in the Street Fighter games series. If you’re looking for midlevel thugs with a distinct comedic flavor then Sodom’s a great choice. Other Aliases: Caucasian desperately wishing to be Japanese. Group Affiliation: Mad Gear, Angry School Girls. Base Of Operations: New York City, but often travels to Japan and is mobile throughout the world. Height: 6’9” Weight: 238 lbs. Eyes: Unrevealed Hair: Unrevealed (because he’s never seen without his mask on). Sodom’s fanatical quest to become Japanese has led him to pick up a slew of both common and uncommon skills. He’s quite competent with melee weapons and a decent martial artist. It would appear that he’s had some ninja training as well. He’s also familiar with Japanese customs, but has yet to master the language. Despite not being the brightest bulb in the batch he’s actually a semi-competent gang leader and somewhat persuasive. Other hobbies include driving a big truck, dancing, sleight of hand, and marine sports. Sodom was a man who was a true Japanese guy in spirit. But he was cursed with being Caucasian!!! What better thing for a poor misunderstood guy like him to do than…join a gang! Sodom joined Mad Gear, which was the perfect place for misunderstood guys like him. His is fighting skill made him respected within the gang. He became the boss of the Subway area of Metro City. Until one day, a ninja named Guy came and challenged him. Sodom was honored to be challenged by a real ninja. He fought Guy in an underground ring within the subway, but Guy defeated him. The resulting defeat humiliated him and he was shown to be inferior to a Japanese man! 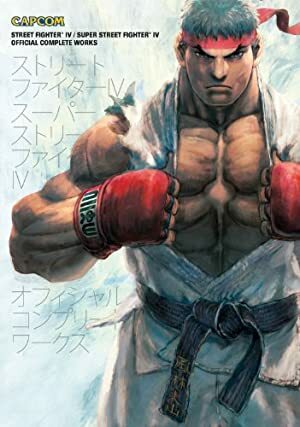 No more was poor Sodom respected, for it was shown that he was no match for a true Japanese fighter. Poor Sodom. Later on, Mad Gear would be defeated through the combined efforts of Guy, Haggar, and Cody. The kabuki fighter, Sodom, sought to achieve true “Japanism.” How would he reach a higher level of cultural worship? He wandered the world, in search of his “brothers”. But Mad Gear was falling apart thanks to Mike Haggar and co! It was up to Sodom to take up the reins and help it get back on its feet. Rising back up the ranks of Mad Gear, Sodom realized that he must recruit new members. He set his sights east to Japan! Japanese warriors would give Mad Gear a fighting chance! Sodom was dismayed when he heard that fellow Mad Gear member and friend, Rolento, had abandoned Mad Gear to start his own army. But he must go on, for the sake of the freedom ideals of Mad Gear! He finally reached Japan and realizes that sumo warriors would be great for Mad Gear! 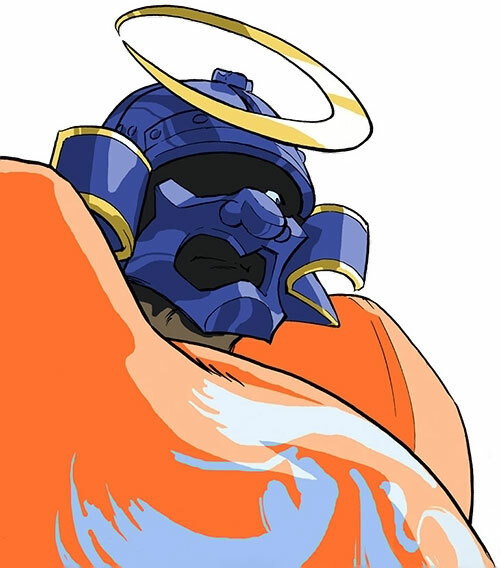 With that, he entered a sumo house and challenged one of them, E. Honda, to a match…and was soundly thrashed. Still Honda respected his determination. Sodom did not appear in the game, but was most likely involved with the revival of Mad Gear behind the scenes. He’s likely the one who recruited Retsu, new leader of the gang. After all Retsu is Japanese and it was stated that he went to Japan for further training. It was a fun match, but sadly, Sodom couldn’t get any sumo wrestlers to join Mad Gear. Mad Gear had died for good. Could the ideals of Mad Gear truly be lost forever? One day he ran into Rolento again. Sodom was stricken with grief that Rolento has broken off from Mad Gear. He told his former comrade that he had lost sight of Mad Gear’s ideals. Which I think was an ideal of freedom through chaos or so, and Rolento was being too strict with the military thing and apparently mainly just wanting power and money. Rolento told Sodom that he hadn’t lost those ideals and that his path was still conductive to those goals. But Sodom didn’t believe him. Rolento then left and began to look for Shadaloo’s armaments to equip his army. He heard about the psycho drive, but then heard about how it only worked by brainwashing people. He eventually realized that they weren’t conducive to his goals and that one can’t have a utopia if people couldn’t make their own decisions. When Sodom saw this, he knew that Rolento hadn’t lost sight of Mad Gear’s ideals after all. So he and Rolento made-up and decided to work together towards their true utopia and ideals once again. Probably still with Rolento working for the perfect utopia. As well as still trying to be Japanese ^_~. 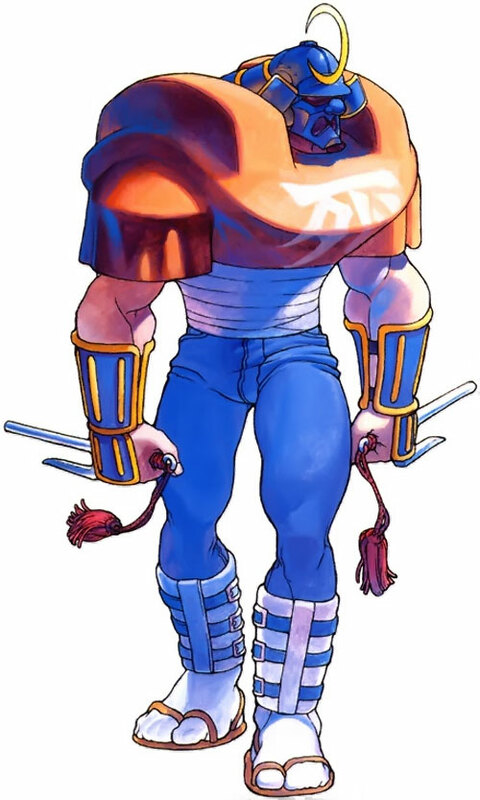 He was originally planned to be in Final Fight Streetwise, but he didn’t make the final cut due to time constraints. Again it’s highly likely that he was working behind the scenes and establishing and leading the Angry School Girls gang. No other known character would do something that looney. Sodom is very tall, but relatively skinny Caucasian man who never ever takes off his samurai armor. 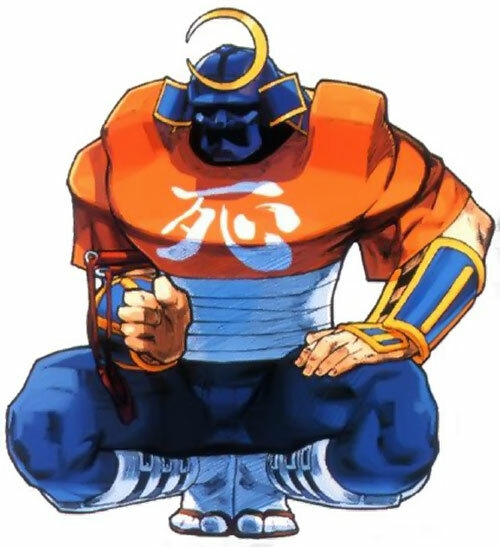 He wears a blue samurai helmet with a gold crescent on top for ornamentation and an orange samurai armor with the Chinese character for death (wrongly painted) on back together with blue pants and tabi socks and sandals. He also usually carries Japanese style weapons and occasionally whips out a fan to do a victory dance with. Sodom is very much a comic relief type character and therefore pretty one dimensional. He’s obsessed with becoming Japanese. He joined the Mad Gear to gain social acceptance in their whole freedom through chaos ideal. He’s so obsessed with the Mad Gear ideals that he actually pursues them long after the gang is destroyed for the second time. Again he’s a comedy relief character. He could be inserted dang near anywhere as a henchmen type of sorts. The DCU doesnt have a whole lot of Japanese characters and inserting a Caucasian wannabe might say something about the status quo. Adrenaline Surge works with all Powers and Weaponry (melee). Area Knowledge (New York City), Familiarity (Japanese customs), Gift of Gab, Iron Nerves, Languages (some Japanese), Local Hero (Japan), Local Hero (Mad Gear), Schtick (Paired Japanese weapons, blindside adept, stance assessment, surefooted) Notes: Sodom isnt actually all that well-known in Japan, but it seems that almost every Japanese person who he comes across finds his desperation to become more Japanese than a Japanese person cute hence the bonus. Rolento (High), E. Honda (Low), All former members of the Mad Gear (Low), Angry School Girls (High). Enemy (Guy), CIA toward becoming Japanese, SIA toward rebuilding the Mad Gear, Minor Rage, MPI (obsessed with becoming Japanese), MIH (Guy). Samurai Armor [BODY 04, Invulnerability: 04, Skin armor: 02, Limitation: Invulnerability and Skin armor only vs. slashing and piercing weapons; Real Armour]. Katana [BODY 06, EV 06, R#00]. 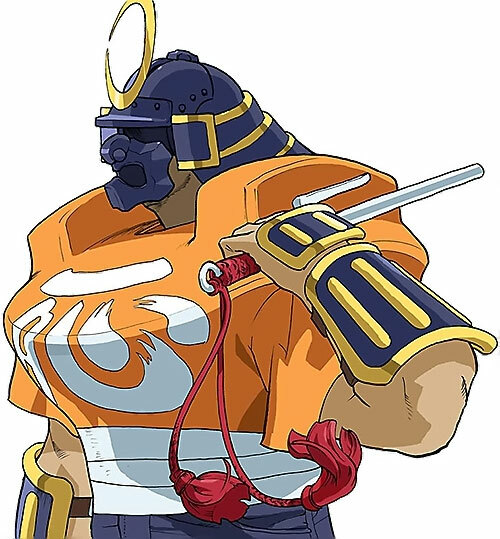 Sodom used a katana in his first appearance as a Mad Gear boss. Its rumored to be of very high quality, hence the slight bonus. Wakizashi (x2) [BODY 04, EV 03, R#00]. Jitte (x2) [BODY 04, EV 03, R#02, +1CS to Block]. Source of Character: Street Fighter and Final Fight.